In this video we will discuss about nesting gridview controls. 1. The outermost grdiview control, should display all the continents available. 2. The Countries column in the outermost gridview control, should display all the countries belonging to the continent in another gridview control. This means we are nesting countries gridview in continents gridview. 3. The Cities column in the countries gridview control, should display all the cities belonging to the country in another gridview control. This means we are nesting cities gridview in countries gridview. Step 1: Create an asp.net web application project. Add a class file with name = ContinentDataAccessLayer.cs. Step 2: Add a class file with name = CountriesDataAccessLayer.cs. Step 3: Add a class file with name = CitiesDataAccessLayer.cs. Step 4: Add Countries property to Continent class, in ContinentDataAccessLayer.cs file as shown below. 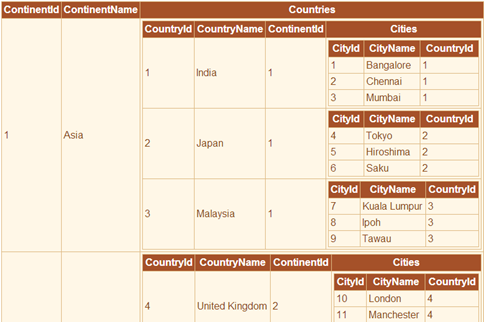 Step 5: Add Cities property to Country class, in CountryDataAccessLayer.cs file as shown below. Step 6: Add a gridview control to your webform. Configure it, to include 2 BoundFields and 1 template field. Set AutoGenerateColumns="False". The 2 bound fields are for displaying ContinentId and ContinentName. Set DataField and HeaderText properties of these 2 bound fields accordingly. Step 7: Drag and drop another gridview control, in TemplateField of GridView1 control. By Default the ID for the newly added gridview control will be GridView2. Now configure GridView2 to include 3 bound fields and a template field. The 3 bound fields are for displaying CountryId, CountryName and ContinentId. Set DataField and HeaderText properties of these 3 bound fields accordingly. Set AutoGenerateColumns="False". Set DataSource attribute of GridView2 control to bind to Countries property. Step 8: Drag and drop another gridview control, in TemplateField of GridView2 control. By Default the ID for the newly added gridview control will be GridView3. Set DataSource attribute of GridView3 control to bind to Cities property. Hi Venkat, how do you implement the same thing but enabling selection on the inner gridviews (countries and cities) where you can edit, delete and add new rows?